The U.S. Army OH-58 Kiowa Warrior is a family of single-engine, single-rotor, military helicopters used for observation, utility, and direct fire support. Manufactured by Bell Helicopters for the United States Army, the OH-58 has been in continuous use by the U.S. Army since 1969. Now it holds a world record. On Apr. 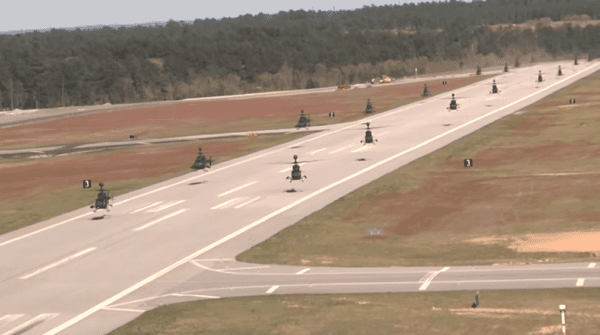 15, 2016, 32 helicopters from 1st Squadron 17th Cavalry Regiment, 82nd Combat Aviation Brigade flew one last flight over Fort Bragg and Fayetteville, NC before retirement, setting a Guinness world record for the largest formation of helicopter aircraft in the process. Go Army! Check out the amazing video. As of today, the record has yet to be broken. The OH-58 Kiowa Warrior was first introduced in 1969. This type of Light Attack Helicopter was first developed by the company Bell Helicopter as the civilian Bell Model 206 JetRanger/LongRanger multi-role helicopter platform. It first flew on December 8, 1962. Since the Bell 206 proved hugely successful, some 7,300 more were eventually produced. Later, the Bell 206 Model was selected by the U.S. Army as the basis for OH-58 Kiowa Warrior. 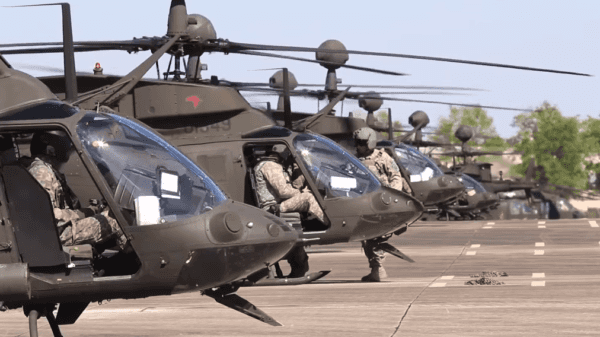 In the years to come, 2,200 more of the hugely successful Kiowa were delivered to the U.S. Army and also to other allied forces as around the world. 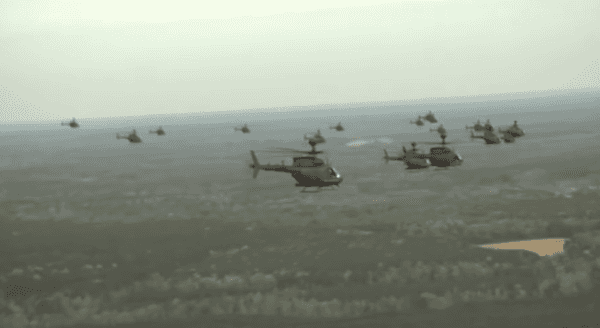 The helicopter played a very vital role in armed reconnaissance, artillery observation, and cavalry formations involving infantry fighting vehicles. The cockpit of the OH-58 Kiowa Warrior seats the pilot and co-pilot and offers fantastic forward viewing because of the large forward windscreens and removable automobile-style hinged side doors. At the back of the cockpit is the passenger cabin with exit-entry doors and also space for an additional two or three people. The engine is set atop, towards the rear of the passenger cabin, powering the main rotor blades. After retiring the OH-58 Kiowa Warrior, it was replaced by the OH-58D. The 17th Cavalry Regiment was constituted on July 1, 1916, making the 1st Squadron, 17th Cavalry Regiment the oldest unit in the Combat Aviation Brigade. The 82nd Combat Aviation Battalion was founded in 1957, and relieved from assignment in 1987. It is currently redesignated as 82nd Aviation, a parent regiment under the United States Army Regimental System. Even though some people, only some, criticized the stunt for wasting the nation’s money, it must also be considered that these helicopters also serve the country and help win fights.